A smaller version of the classic shape - see Redwood listing. 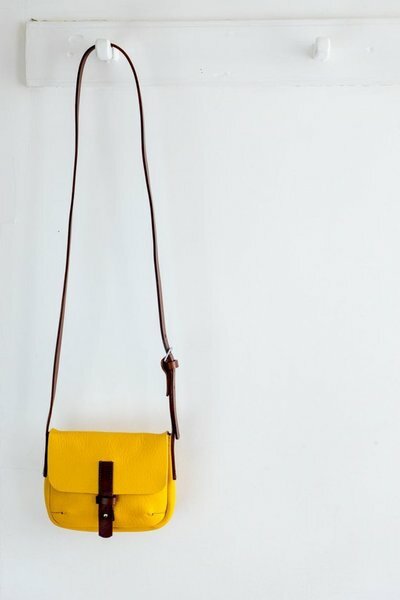 This bag is made in thick and supple ripley yellow full grain leather, all the leathers used are limited in supply so there are only a certain number of bags made from each individual skin. This particular leather is a bright and sunny yellow, lovely and supple and can be easily cared for with neutral leather cream. The strap is a rich chestnut brown, thick and sturdy 3.5mm leather, and is adjustable ranging from 116.5cm on the shortest hole up to 124cm on the longest. The buckle and all other hardware on the bag is silver coloured. This bag has been lovingly handmade from start to finish by Alice in her small workshop in Totnes, South Devon.